Now would be as good a time as any for the notoriously relaxed Cape Town to lose its cool, yet for the most part life in the picturesque city loved by international tourists ambles along. Earlier this month, Cape Town was declared a disaster area as the water supply dwindled due to a drought across the Western Cape province. Officials assured reporters that the declaration wasn’t meant to send the city’s four million residents into panic, but rather to get around bureaucratic red tape to free up some money to deal with the crisis. 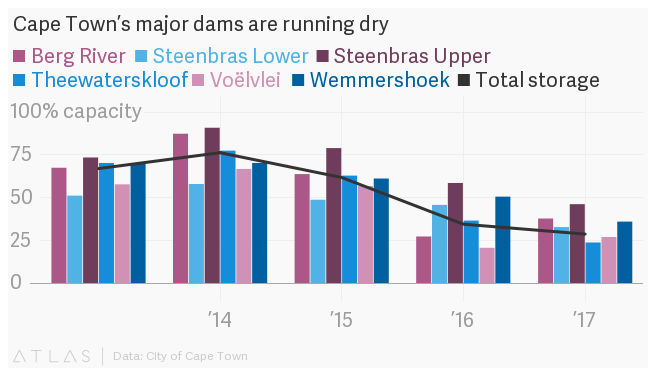 By March 20, water levels at the major dams supplying Cape Town had dropped to 28,6%, which is 1.4% less than the week before, according to statistics from the mayor’s office. What’s worse, the last 10% of dam water isn’t fit for human consumption. At those levels, Cape Town has 103 days of water left. The city has pleaded with people to save water and restrictions have been in place since December. So far, water consumption has been reduced by 27%, but that is still 137 million liters more than the targeted 700 million liters a day, according to mayor Patricia de Lille. To add to the urgency, Cape Town has also named and shamed 20,000 water wasters. Little but some public embarrassment came of it, as the city handed out notices to just 499 water wasters and threatened to fine any repeat offenders. Cape Town, or the Mother City as South Africans call it, is a very popular tourist city with international tourists from outside Africa and its visitor numbers grew last year. People come to see its beautiful beaches, Table Mountain and to get on a ferry to Robben Island. Many also attend business conferences. The city’s response to the crisis has been hamstrung by its own five-year plan. Building infrastructure like desalination plants for the surrounding water or collections systems for the run-off water have to be carefully considered as part of a long-term investment. And besides, the city’s most impoverished residents barely have flushing toilets or piped water, so building a state-of-the art desalination system (which would cost 8 billion rand or $632 million for 55 billion liters a year) would seem “unconscionable,” as one academic put it. The Theewaterskloof dam, the largest dam supplying water to Cape Town. The other option is to recycle by “tapping into wastewater as a valuable resource,” the city said in a statement on World Water Day on March 22. While 6% of wastewater is currently being recycled for uses other than human consumption, a more sustainable recycling project has yet to get past the first phase of the pilot stage, the statement said. Cape Town’s usually wet, miserable winter may be a boon this year around, but the weather service fears the June/July rainfall may be too little too late. Until then, the city can only hope that citizens will use water responsibly, even after the rains eventually return.